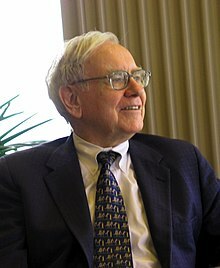 Warren Buffett (born 30 August 1930) is an American investor who is known for his wealth. He was born in Omaha, Nebraska. He is a primary shareholder, chairman and CEO of the company Berkshire Hathaway. He is the third wealthiest person in the world. On April 11, 2012, he was diagnosed with prostate cancer, for which he completed treatment in September 2012. ↑ "Warren E Buffett, CEO Compensation". Forbes. March 30, 2006. Retrieved February 23, 2009. ↑ Bailey, Jeff; Dash, Eric (September 1, 2006). "How Does Warren Buffett Get Married? Frugally, It Turns Out". The New York Times. Retrieved May 20, 2008. ↑ Luisa Kroll, Matthew Miller (2010-03-10). "The World's Billionaires". Forbes.com. Archived from the original on 2012-12-16. Retrieved 2010-03-11. ↑ Telegraph staff and agencies (17 April 2012). "Warren Buffett diagnosed with prostate cancer". The Daily Telegraph. London. Retrieved 17 April 2012. ↑ Lopez, Ricardo (September 16, 2012). "Warren Buffett completes prostate cancer treatment". The Los Angeles Times. Retrieved 22 September 2012. Stempel, Jonathan (February 12, 2008). "FACTBOX: Warren Buffett at a glance". Reuters. This page was last changed on 15 September 2018, at 20:24.